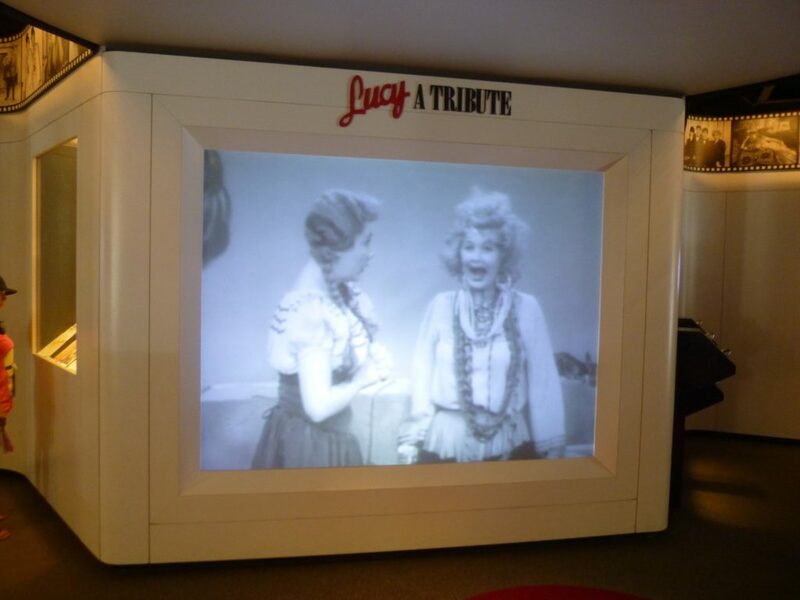 Lucy: A Tribute featured many original artifacts celebrating the life and career of beloved television star, Lucille Ball. 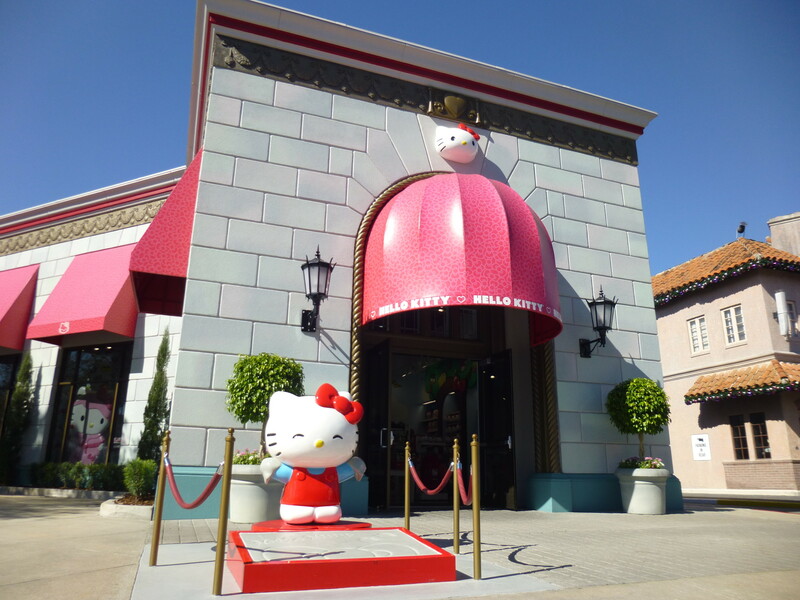 A similar attraction had previously opened at Universal Studios Hollywood in 1989. 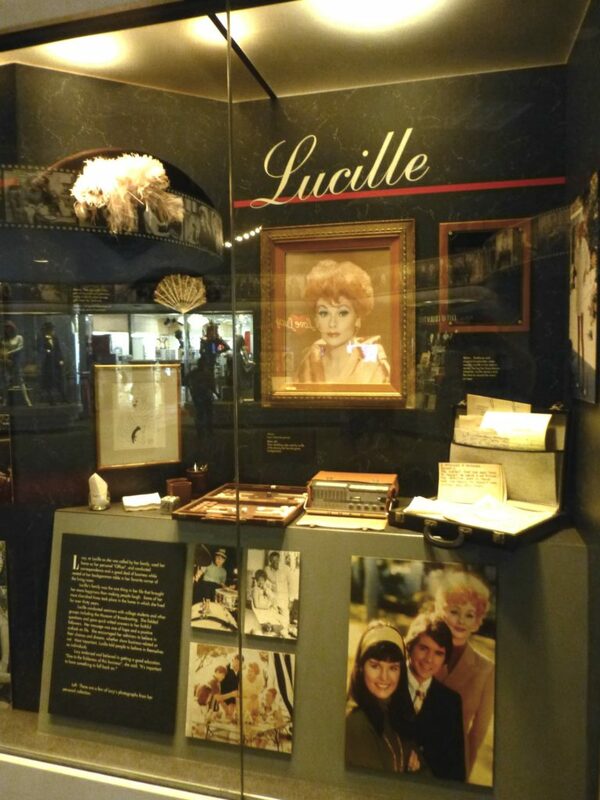 They still had so much memorabilia leftover that they decided to open a duplicate exhibit on the East Coast. 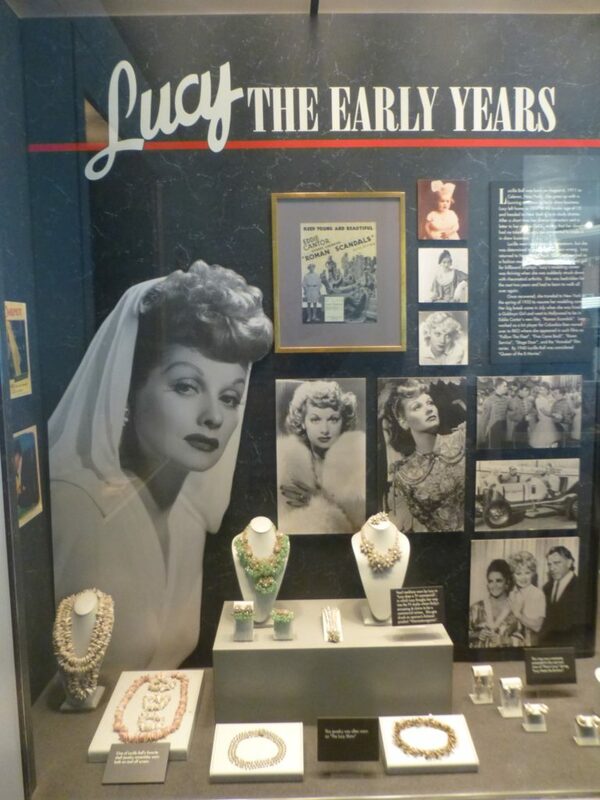 In addition to the many costumes, portraits, personal letters and jewelry worn by Lucy, there were also all five of her shows’ Emmys on display. 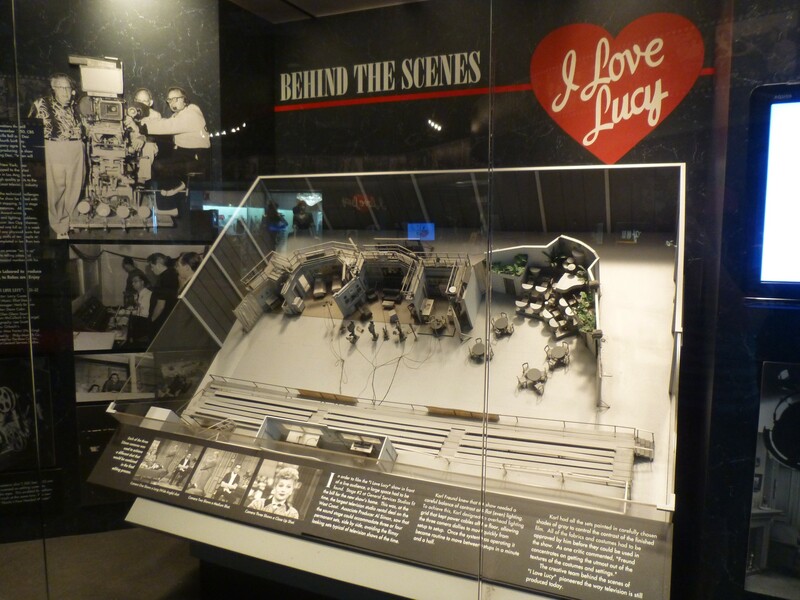 My favorite piece of the exhibit was a complete recreation of the set for her show, “I Love Lucy.” This 3-dimensional small scale model showed the ingenuity of her entirely new (at the time) approach to filming a television program. 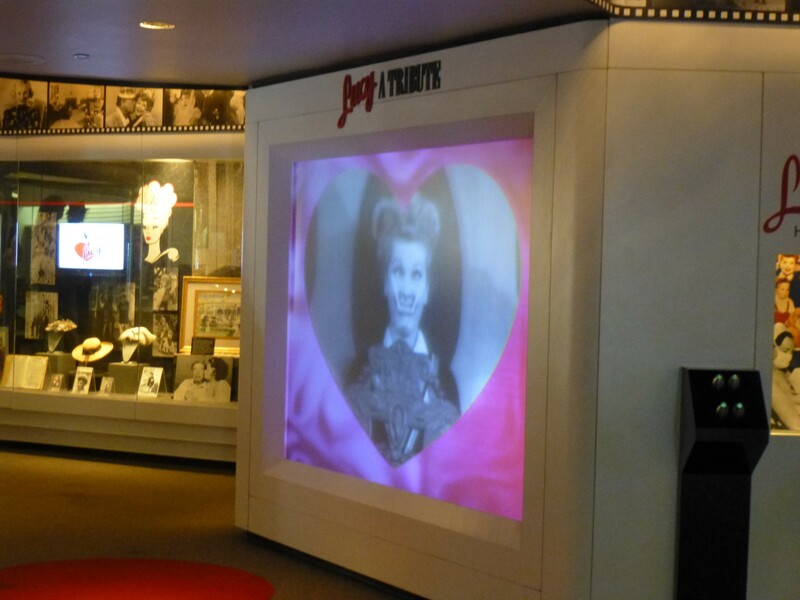 She and her team revolutionized the three-camera format that is still widely used in television to this day. 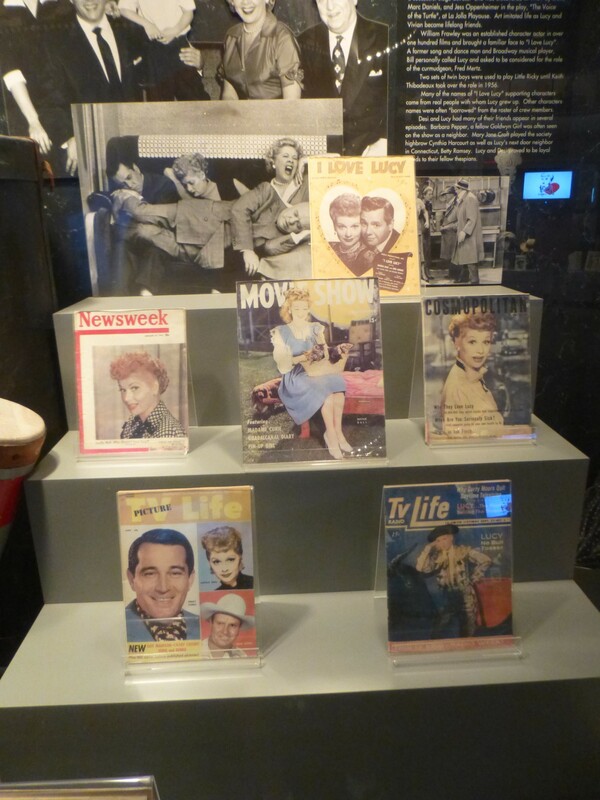 Lucille Ball literally invented the sitcom as we know it, and I always found this display fascinating because of that. 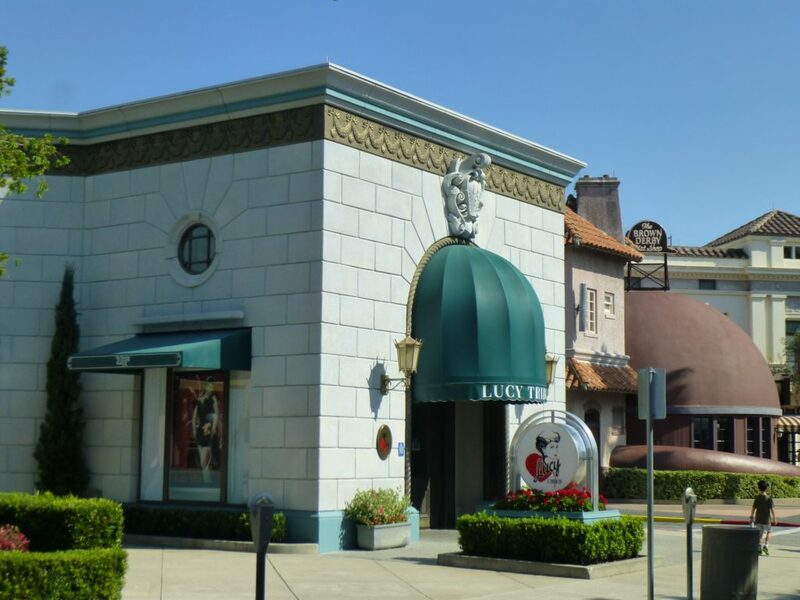 Unfortunately, Lucy: A Tribute closed permanently on August 17, 2015 to make way for a Hello Kitty-themed store which opened in March 2016. With news of its eventual fate, I decided to photograph the entire attraction in June of 2015, just two months before it left us forever. 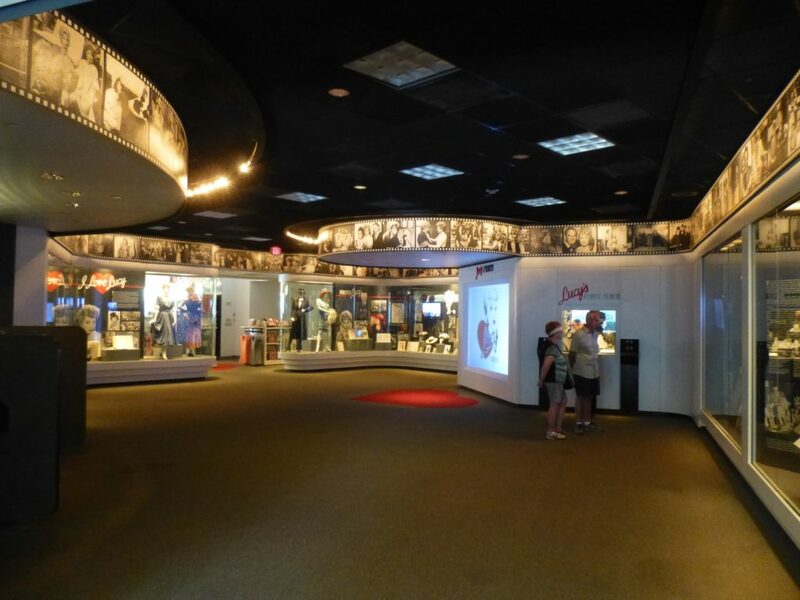 Please enjoy my complete photo collection below, as well as additional information about each of the exhibits this wonderful attraction used to contain. 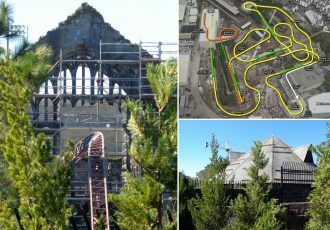 And follow the site for more articles looking back at the attractions of the past, coming soon. 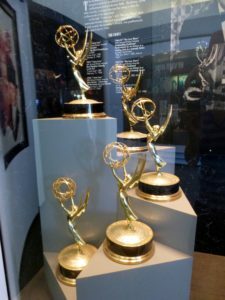 The Academy of Television Arts and Sciences presents annual awards for excellence in the television performance and production fields. 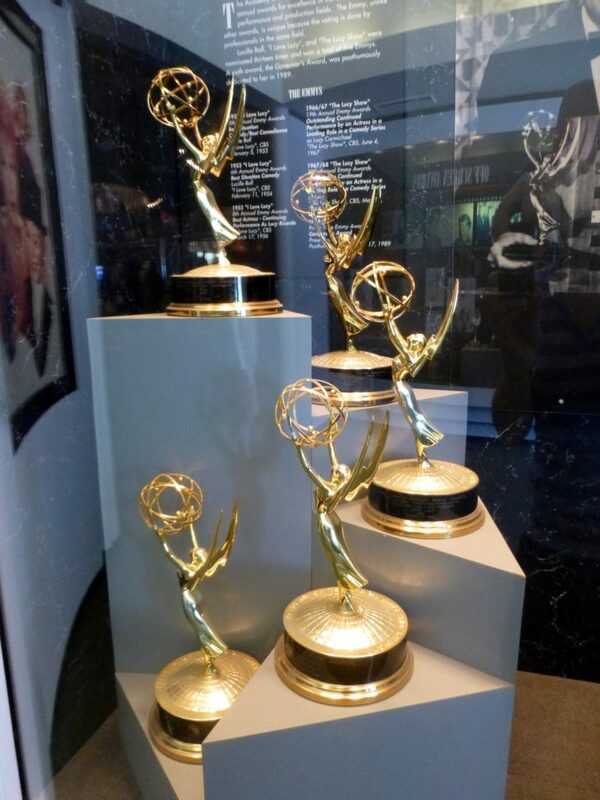 The Emmy, unlike other awards, is unique because the voting is done by professionals in the same field. 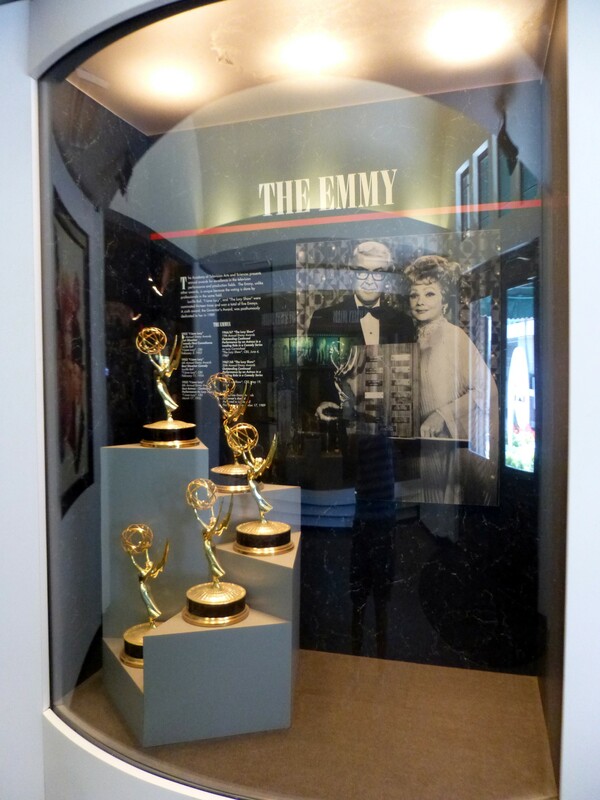 Lucille Ball, “I Love Lucy”, and “The Lucy Show” were nominated thirteen times and won a total of five Emmys. 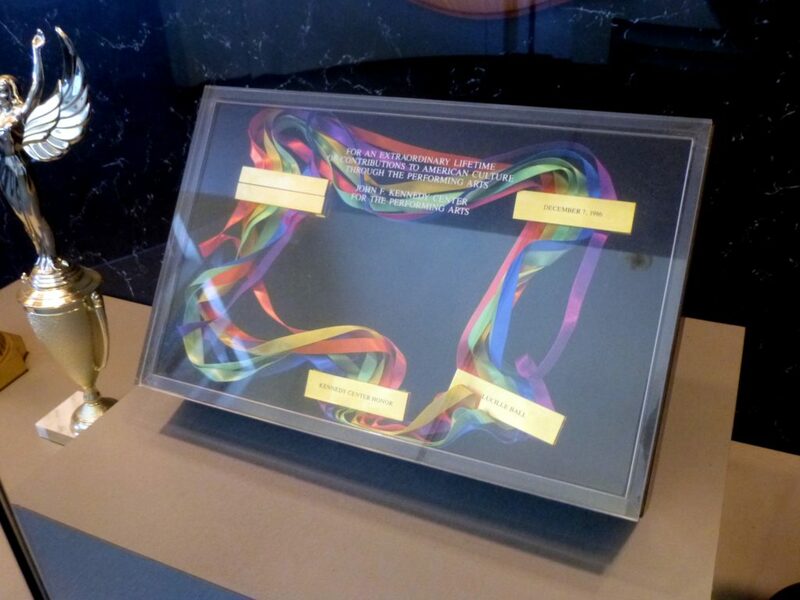 A sixth award, the Governor’s Award, was posthumously dedicated to her in 1989. 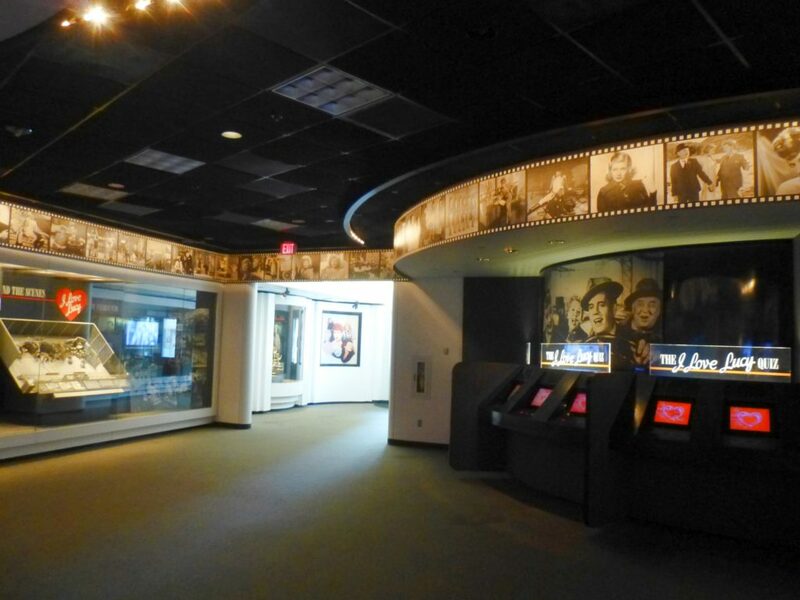 Each of the three 35mm cameras was used to achieve a different shot that would be combined in the final editing process. 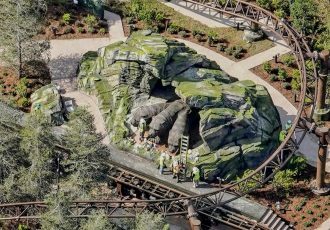 • Camera One Shows a Long (Wide Angle) shot. • Camera Two Shows a Medium Shot. • Camera Three Shows a Close Up Shot. In order to film the “I Love Lucy” show in front of a live audience, a large space had to be found. Stage #2 at General Services Studios fit the bill for the new show’s home. 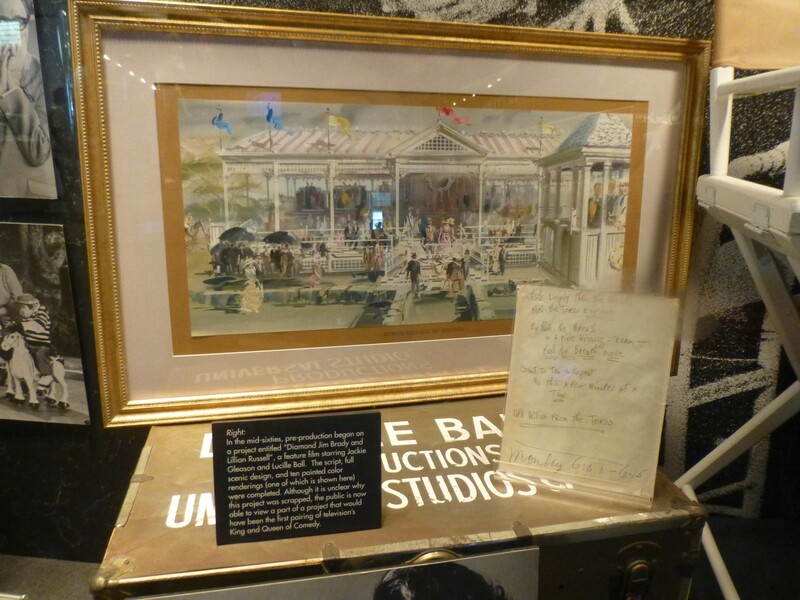 This was, at the time, the largest television studio rental deal on the West Coast. 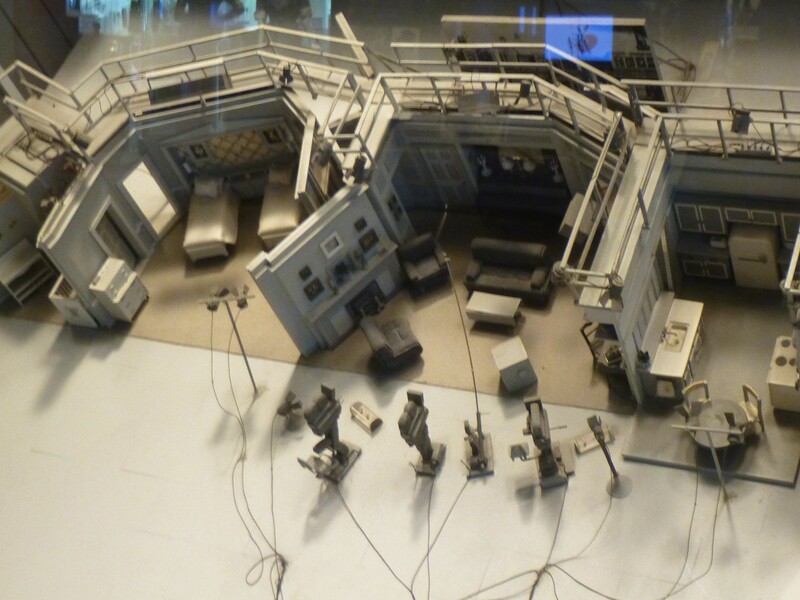 Associate Producer Al Simon, saw that the sound stage could accommodate three or four permanent sets, side by side, avoiding the flimsy looking sets typical of television shows of the time. 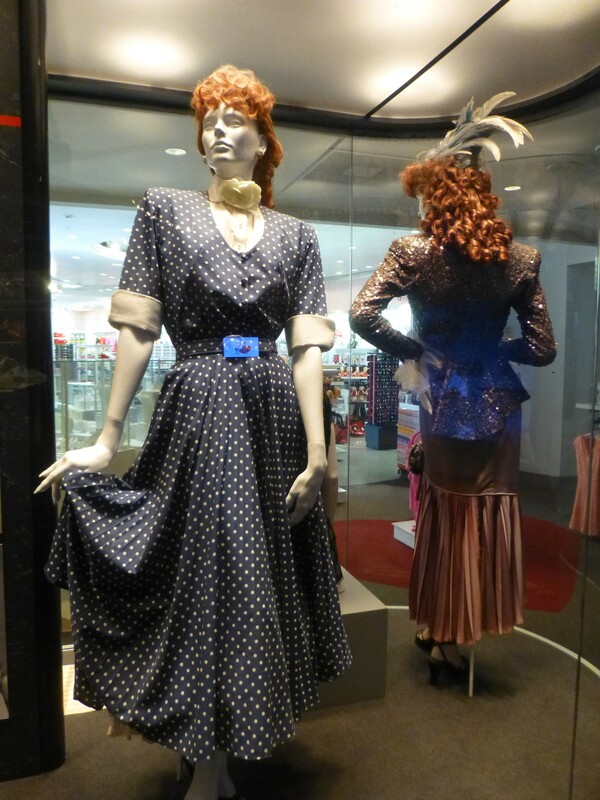 Karl Freund knew that the show needed a careful balance of contrast and flat (even) lighting. 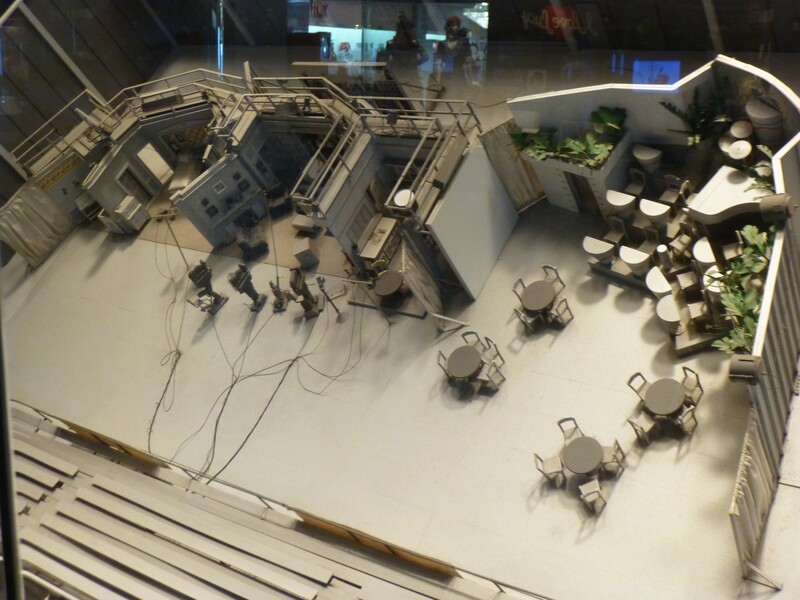 To achieve this, Karl designed an overhead lighting grid that kept power cabled off the floor, allowing the three camera dollies to move quickly from setup to setup. Once the system was operating it became routine to move between setups in a minute and a half. 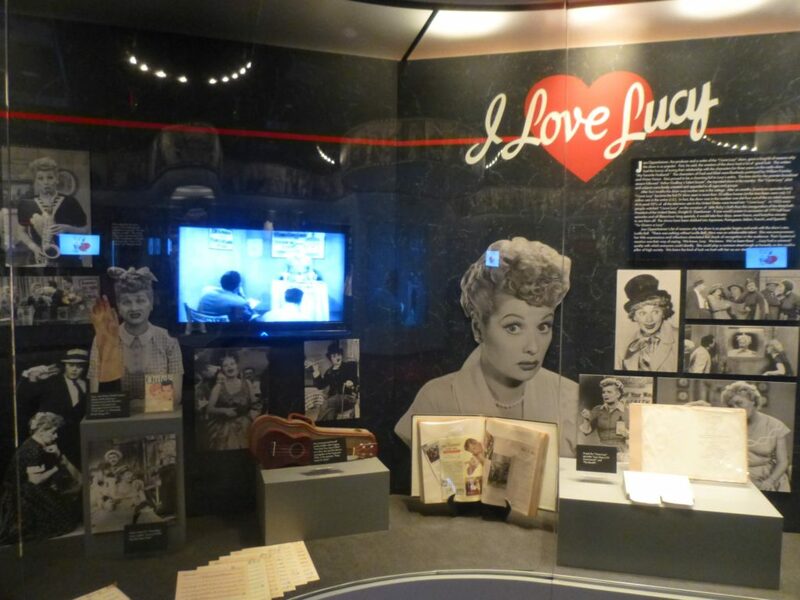 The creative team behind the scenes of “I Love Lucy” pioneered the way television is still produced today. 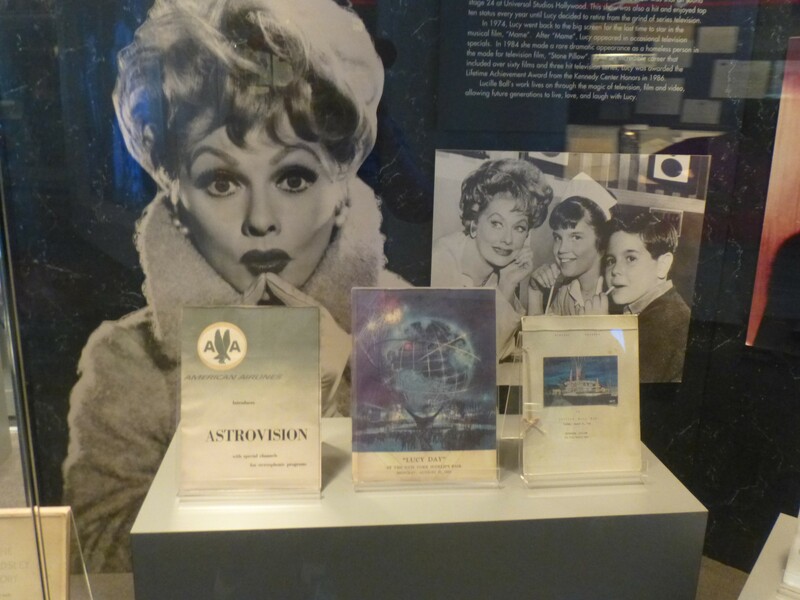 In 1948, the radio show, “My Favorite Husband”, starring Lucille Ball and Richard Denning, had become very popular with listening audiences. It was suggested by CBS to bring this show to the new medium of television. 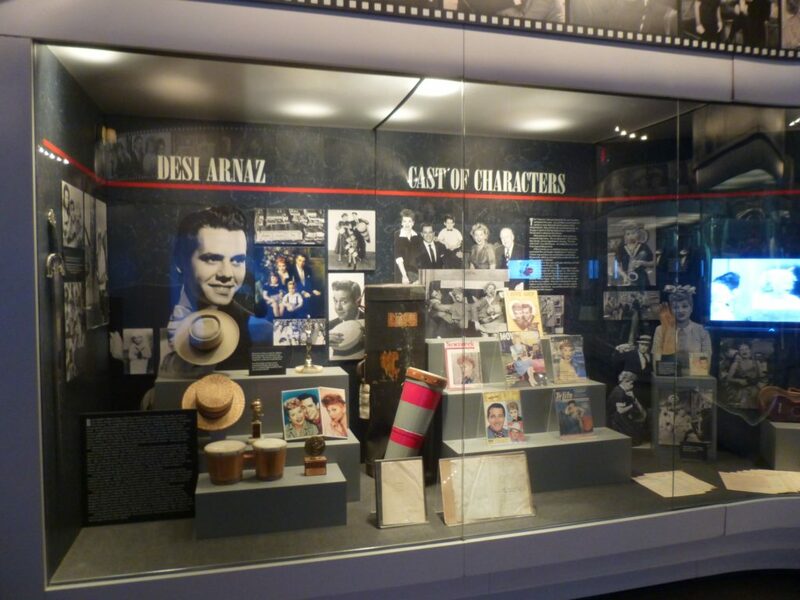 Lucille would only do the television version if her real-life husband, Desi Arnaz, were her co-star. CBS wasn’t convinced that the American public would believe in the concept of an all-American redhead married to a Cuban band leader. 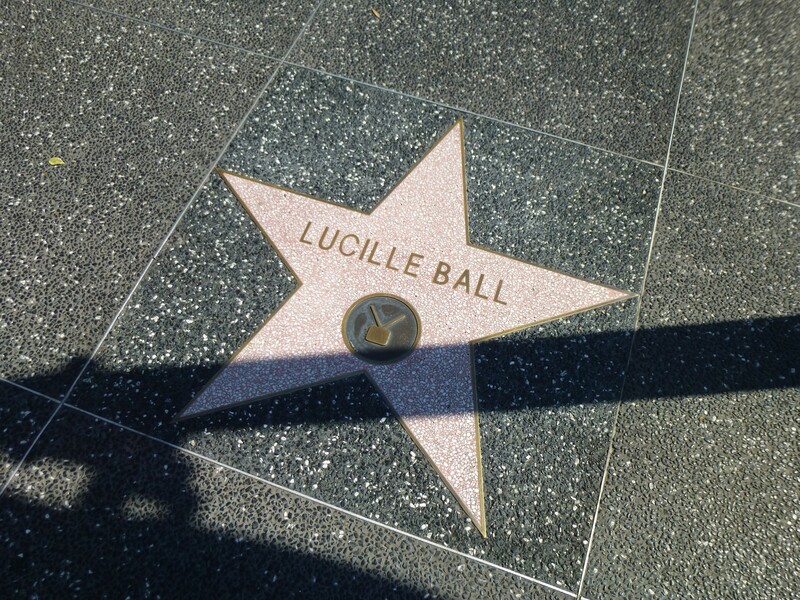 But Lucille was determined to co-star with Desi and insisted, “What do you mean nobody’ll believe it? 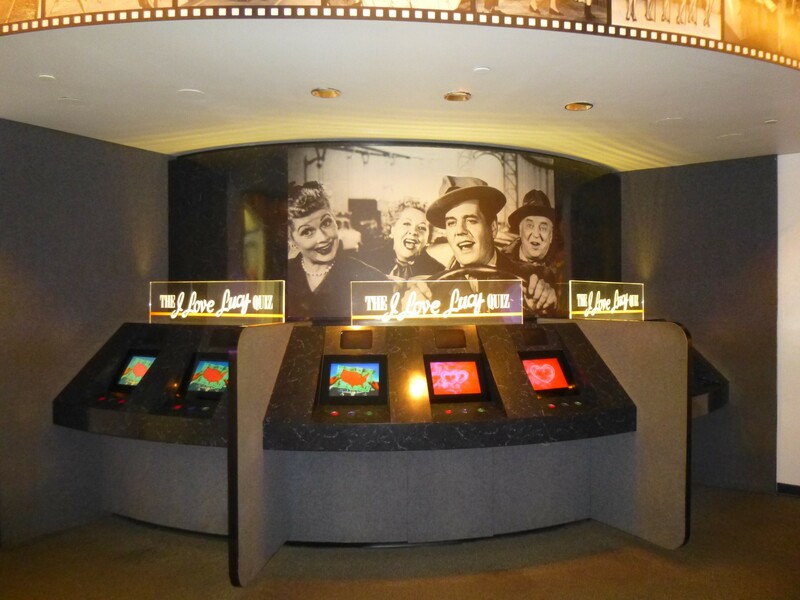 We are married!” Lucy and Desi, along with the Jess Oppenheimer, Bob Carroll, Jr., Madelyn Pugh, Pepito the Clown, and Buster Keaton, created a vaudeville act to be performed around the country. 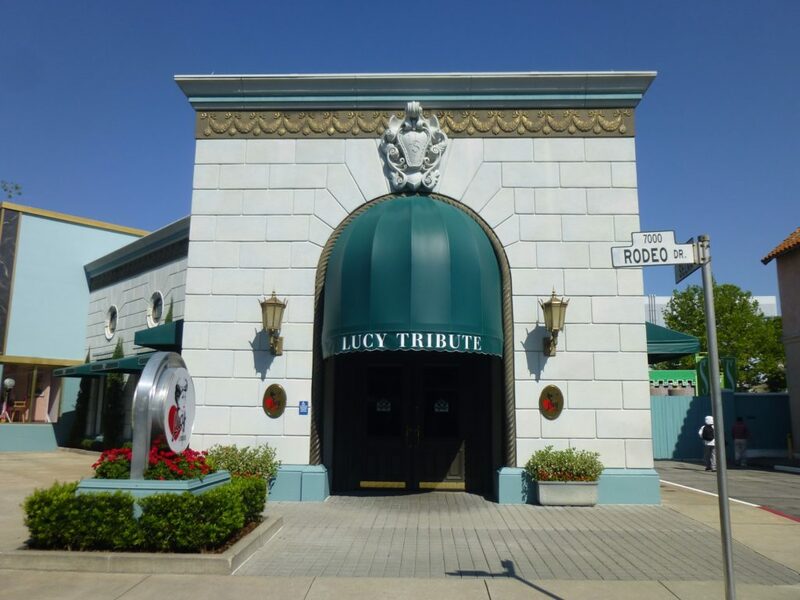 The act, if successful, would show the network that the American public public would accept the pair as a happily married conga player and his kooky, star-struck wife. Audiences across the country received them with enthusiasm. An offer to do a show with NBC finally convinced CBS and “I Love Lucy” was on its way to becoming the most popular sitcom in television history. 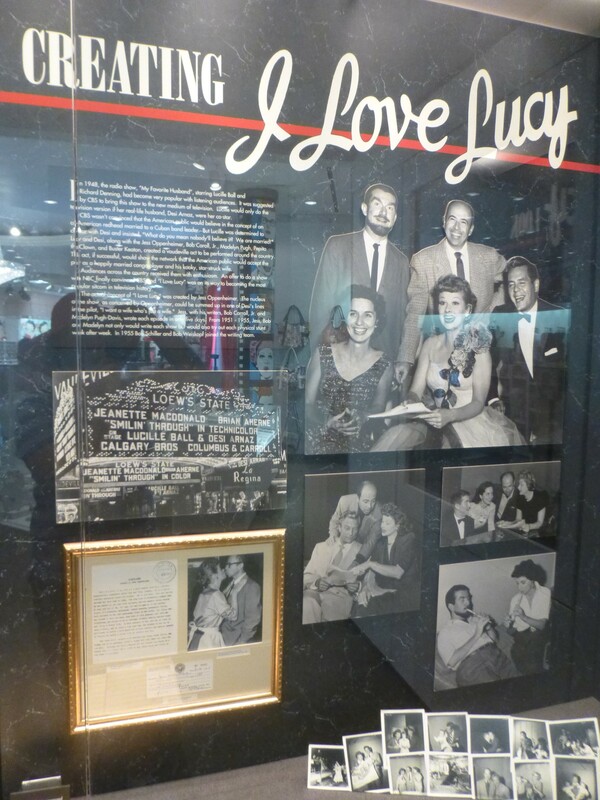 The actual concept of “I Love Lucy” was created by Jess Oppenheimer. The nucleus of the show, as conceived by Oppenheimer, could be summed up in one of Desi’s lines in the pilot, “I want a wife who’s just a wife.” Jess, with his writers, Bob Carroll, Jr. and Madelyn Pugh-Davis, wrote each episode in only five days. From 1951-1955, Jess Bob and Madelyn not only would write each show but would also try out each physical stunt week after week. 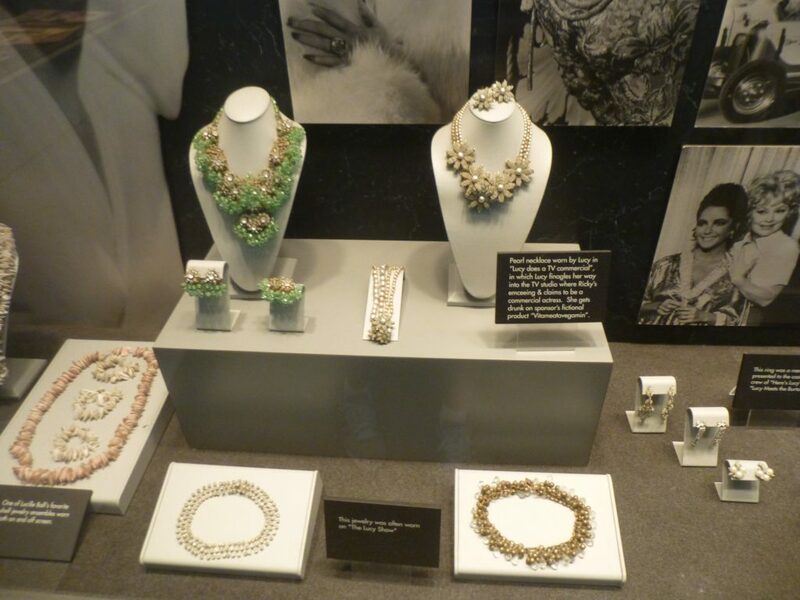 In 1955 Bob Schiller and Bob Weiskopf joined the writing team. 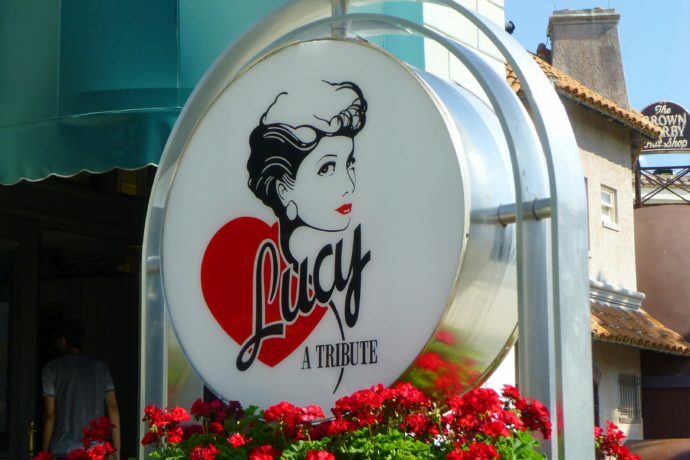 The distinctive “Lucy Ricardo Look” was created by Elosi Jenssen. 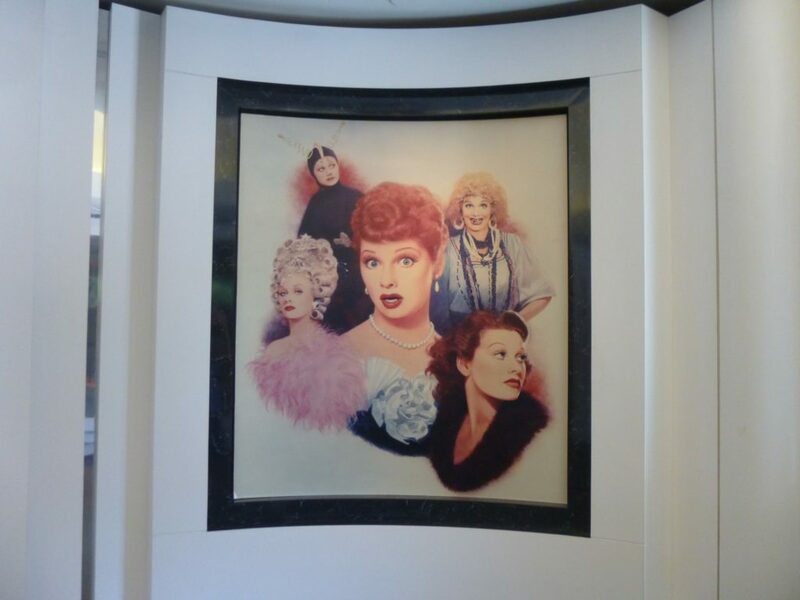 Miss Jenssen’s relationship with Lucy had begun four years prior to the debut of “I Love Lucy” when she was assigned to design costumes on the film “Lured” which starred Lucille Ball. 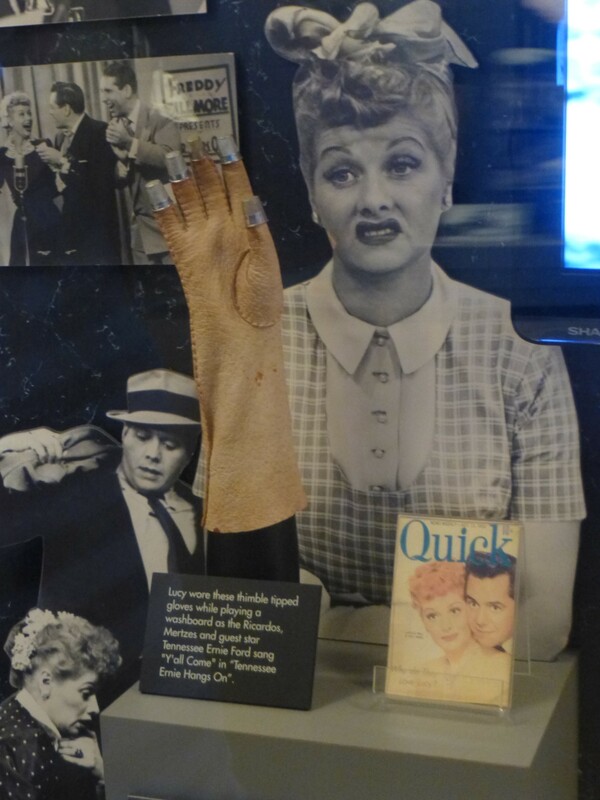 Lucy and Miss Jenssen had a congenial working relationship; when a costume designer was needed in 1951 for “I Love Lucy”, Lucille Ball called Elois. 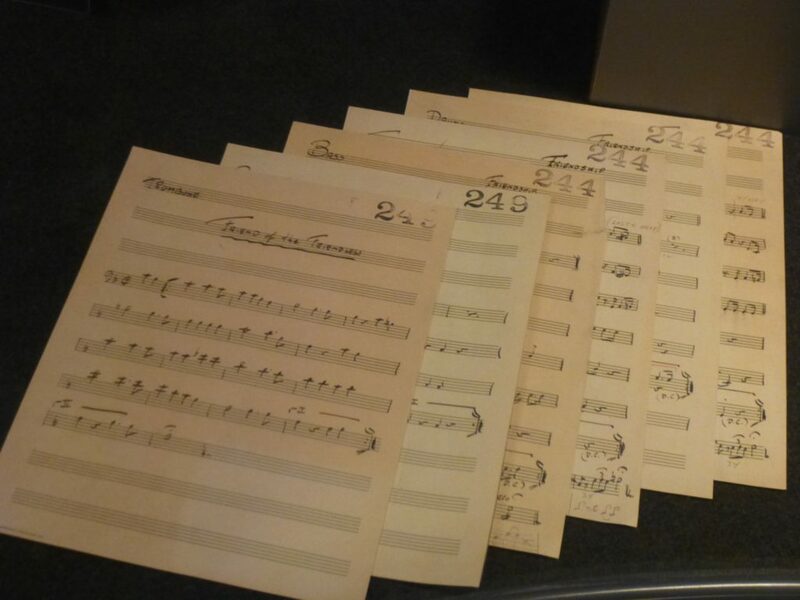 Miss Jenssen was under exclusive contract to Twentieth Century Fox at the time, and was unavailable to take the position. YTwo years later, at the beginning of the third season of “I Love Lucy”, Elois was free to offer her services and the “Lucy Look” was born. 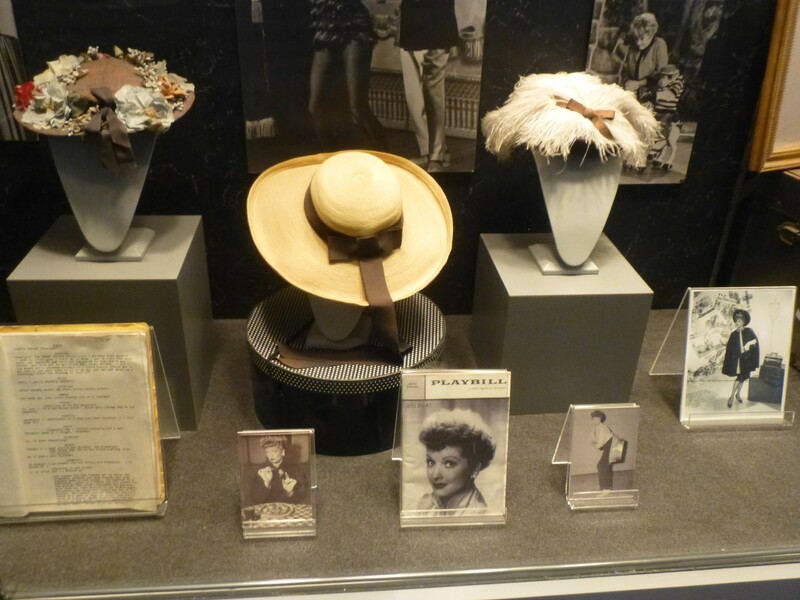 She began by setting up an entire wardrobe department at Desilu. 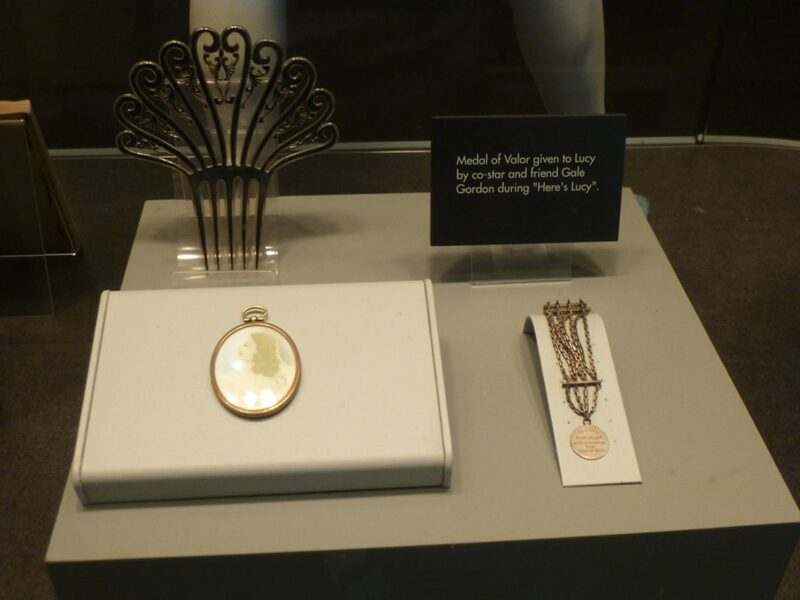 Then, Elois created what Lucy described as the look of a “typical American housewife”. 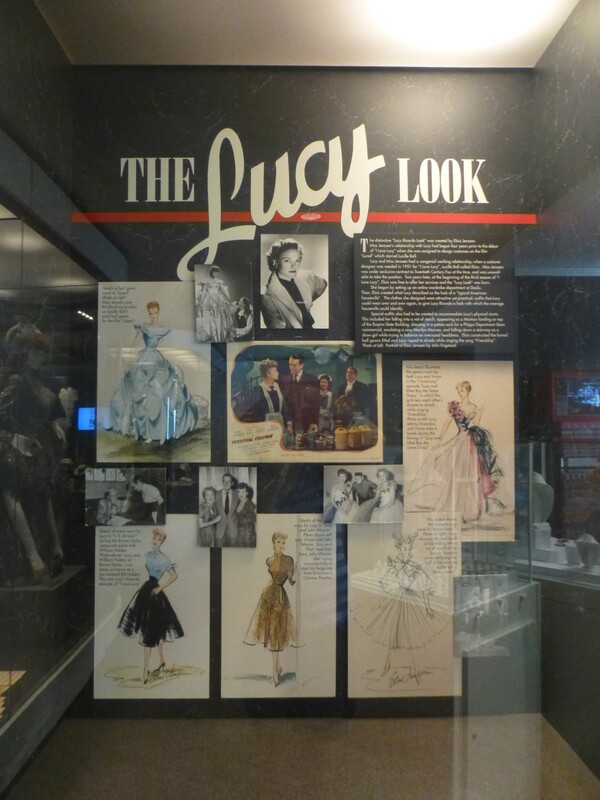 The clothes she designed were attractive yet practical; outfits that Lucy could wear over and over again, to give Lucy Ricardo a look with which the average housewife could identify. 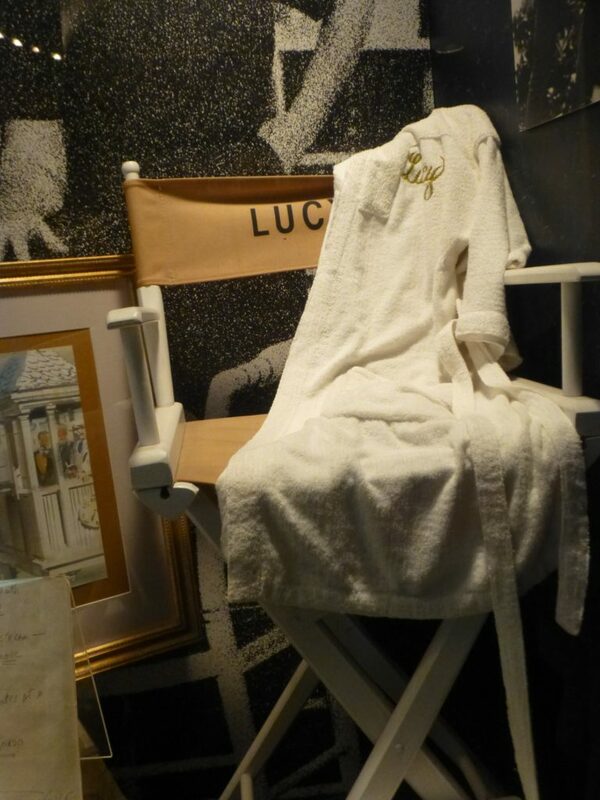 Special outfits also had to be created to accommodate Lucy’s physical stunts. 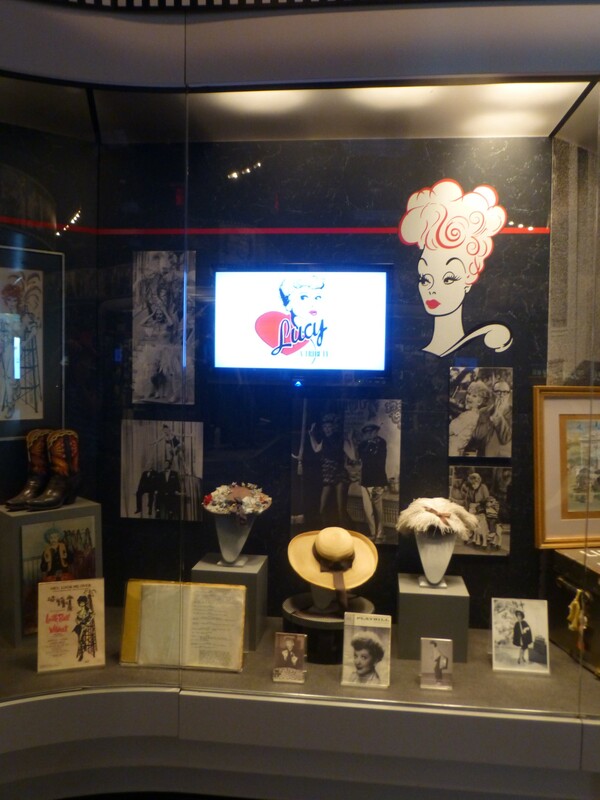 This included her falling into a vat of starch, appearing as a Martian landing on top of the Empire State Building, dressed in a potato sack for a Phipps Department Store commercial, emulating a secy Marilyn Monroe, and falling down a stairway as a show girl while trying to balance an oversized headdress. 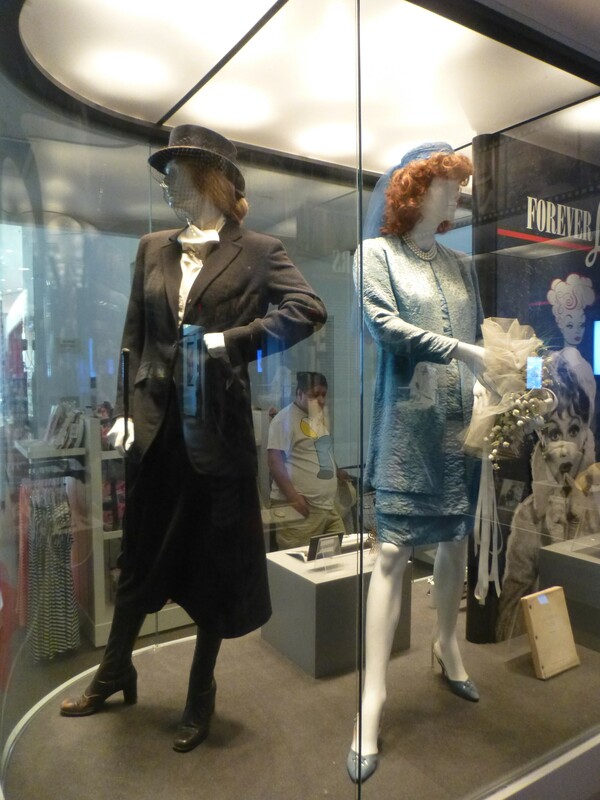 Elois constructed the formal ball gowns Ethel and Lucy ripped to shreds while singing the song “Friendship”. 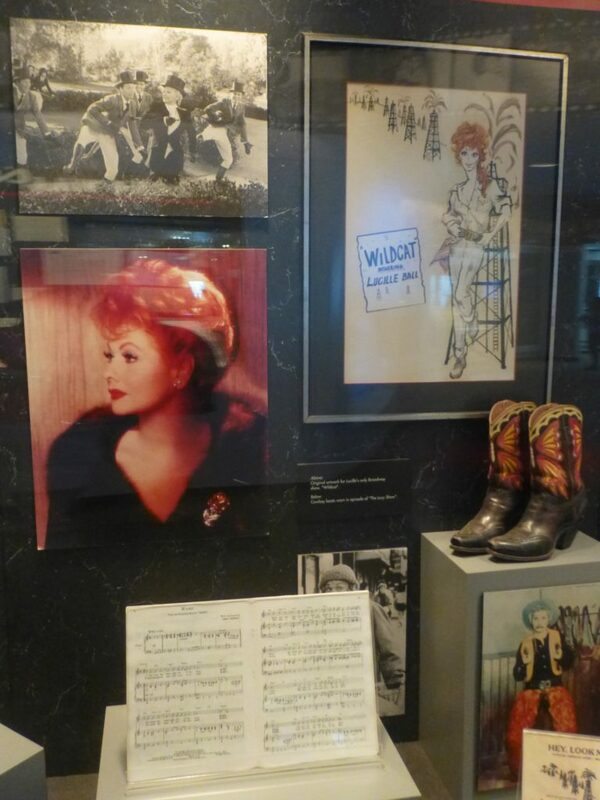 Lucille Ball had many professional friendships with politicians, dignitaries, and well-known celebrities. She maintained close friendships with many of her colleagues and admirers. 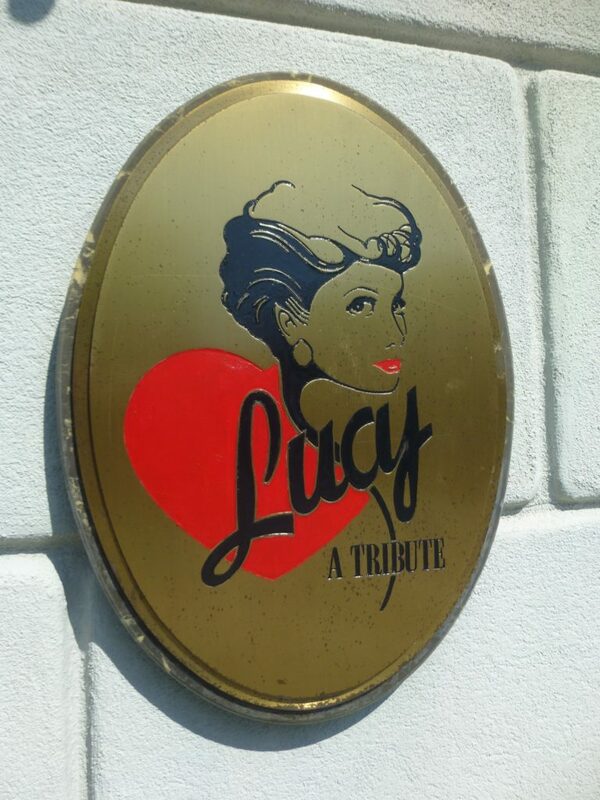 One of the most popular sites on the Hollywood Homes Tour was Lucy’s house. 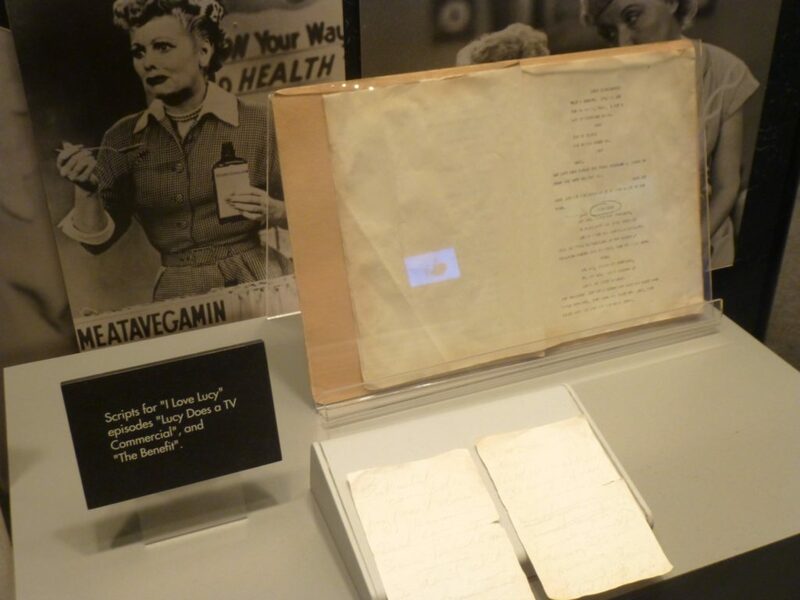 As a result, thousands of letters from her fans and admirers were delivered to her door. 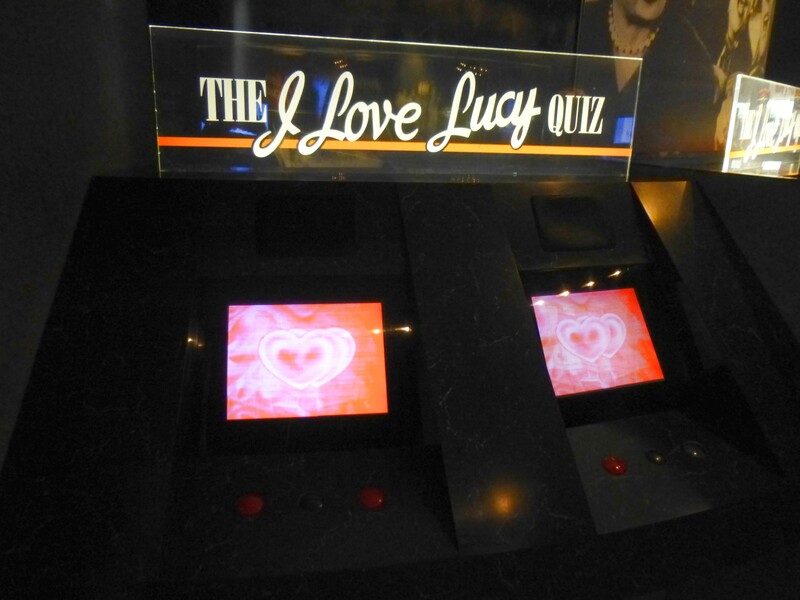 Being devoted to pleasing her fans, Lucy spent many hours sitting at her backgammon table reading and responding to the many letters she received. 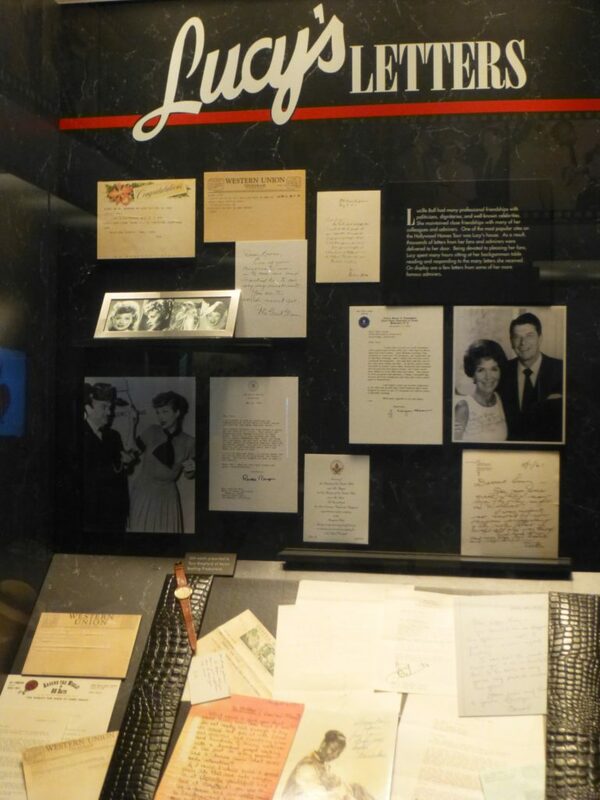 On display are a few letters from some of her more famous admirers. 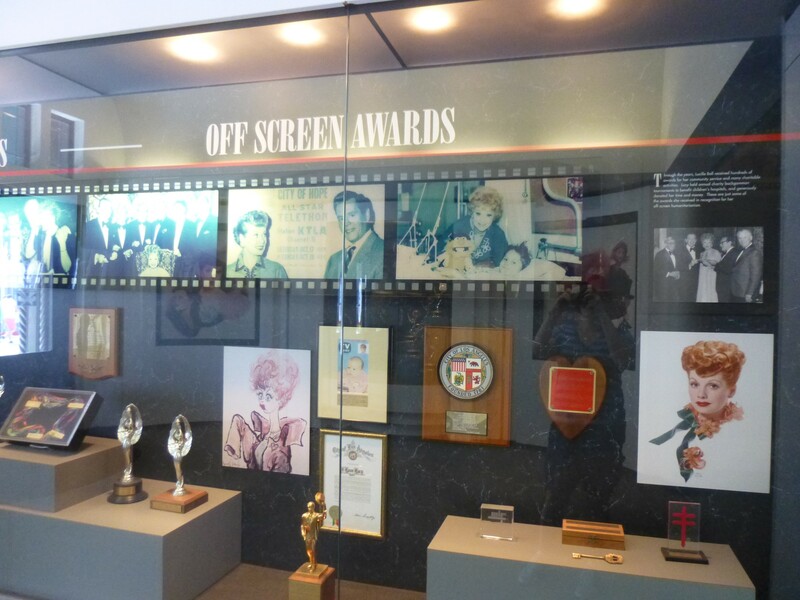 Through the years, Lucille Ball received hundreds of awards for her community service and many charitable activities. 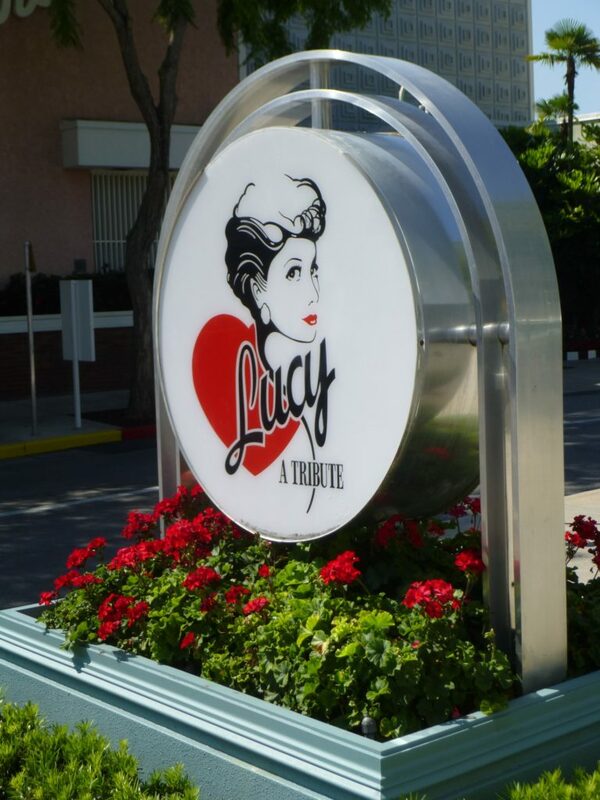 Lucy held annual charity backgammon tournaments to benefit children’s hospitals, and generously donated her time and money. 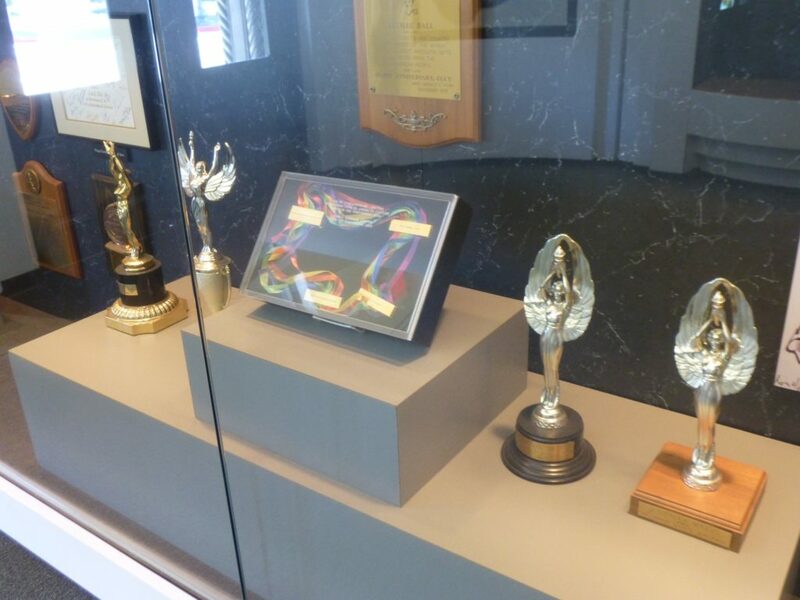 These are just some of the awards she received in recognition for her off-screen humanitarianism. 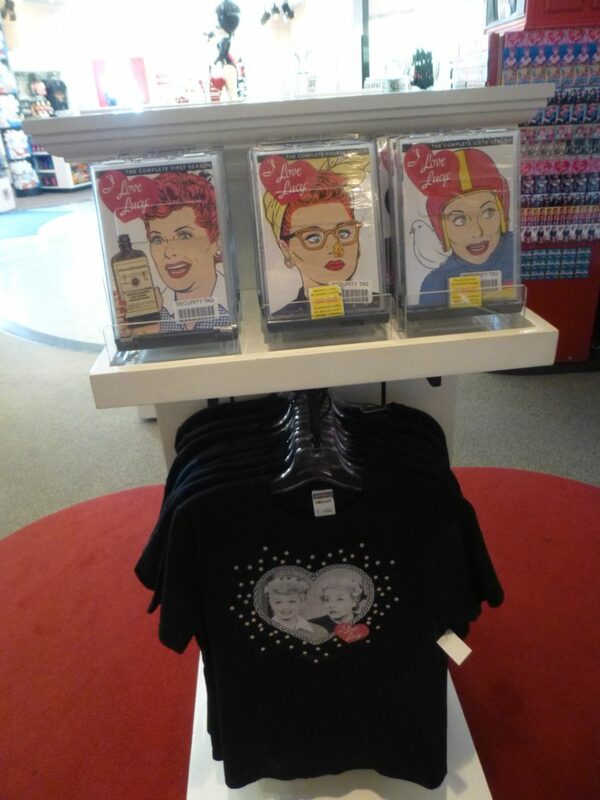 As long as there have been Lucy fans, there has been a demand for Lucy related merchandise. 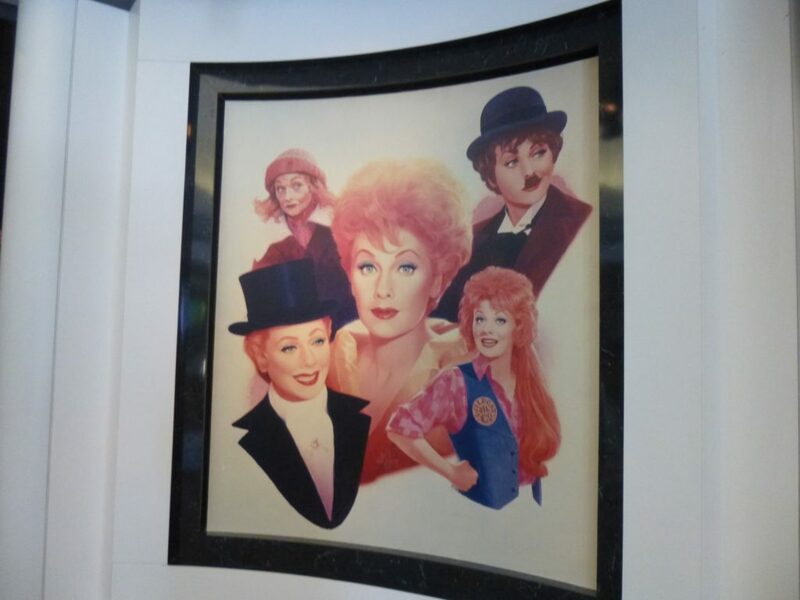 The craze began in the 1940s with Lucille Ball paper dolls, and continued through the 1950s with merchandise like “I Love Lucy” coloring and comic books and Lucy and Ricky pajamas. 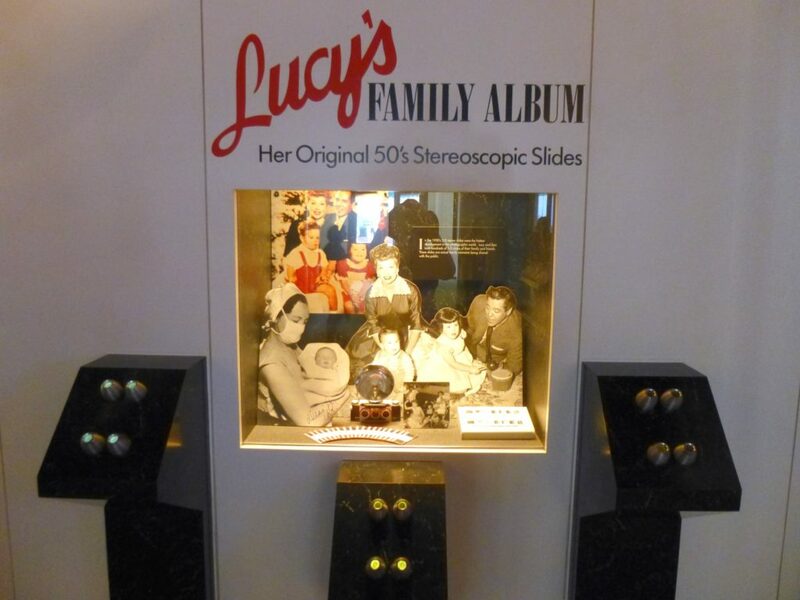 Lucy merchandising hit a peak when the Little Ricky dolls sold 1 million units during Christmas 1953. 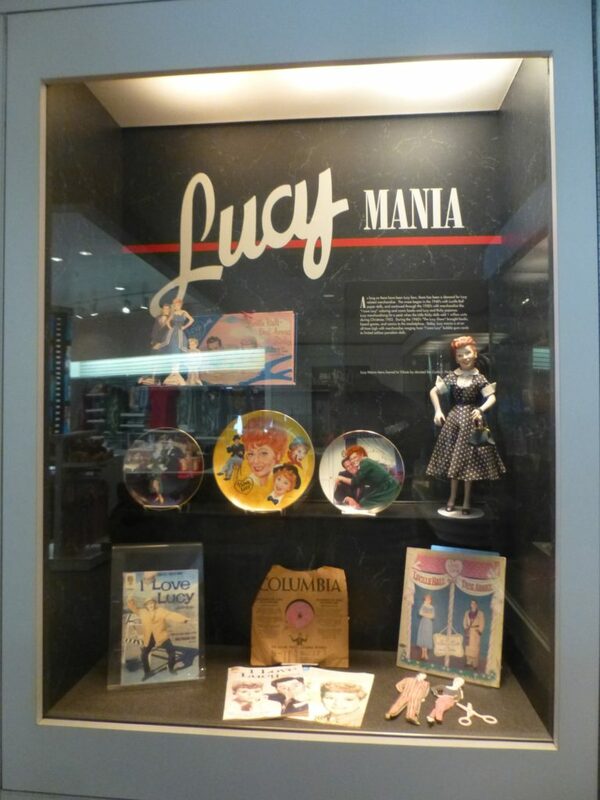 During the 1960s “The Lucy Show” brought books, board games, and comics to the marketplace. 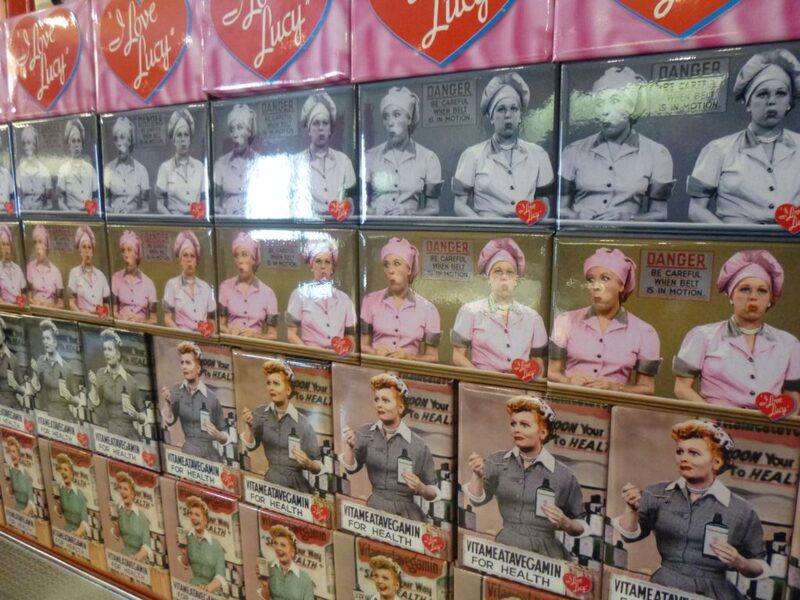 Today, Lucy mania is at an all-time high with merchandise ranging from “I Love Lucy” bubble gum cards to limited edition porcelain dolls. This sign was on the way out. 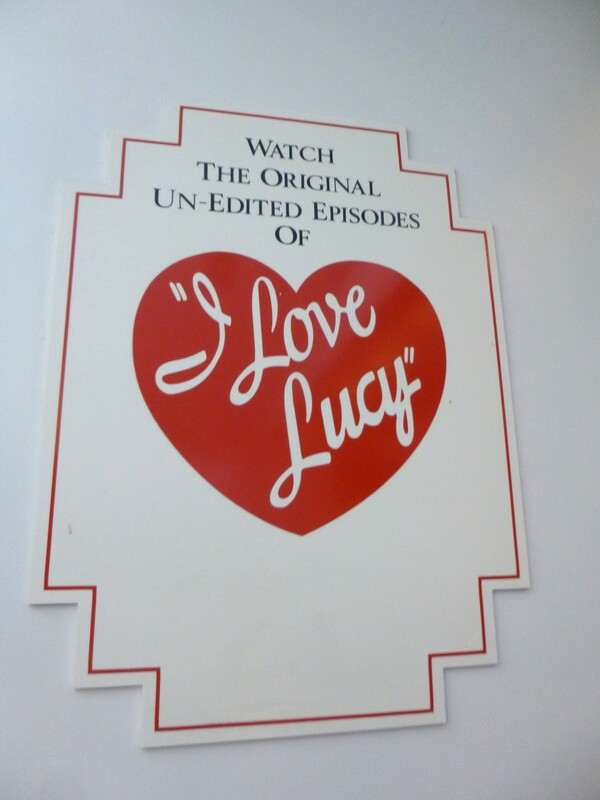 Seems to me like an attack on reruns that cut out bits for more commercial time. 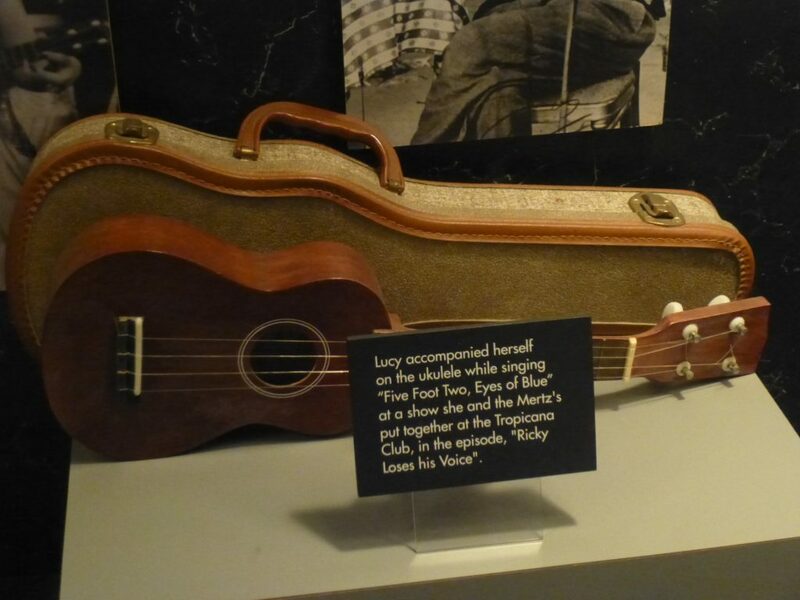 There you have it, Lucy: A Tribute. It is missed. 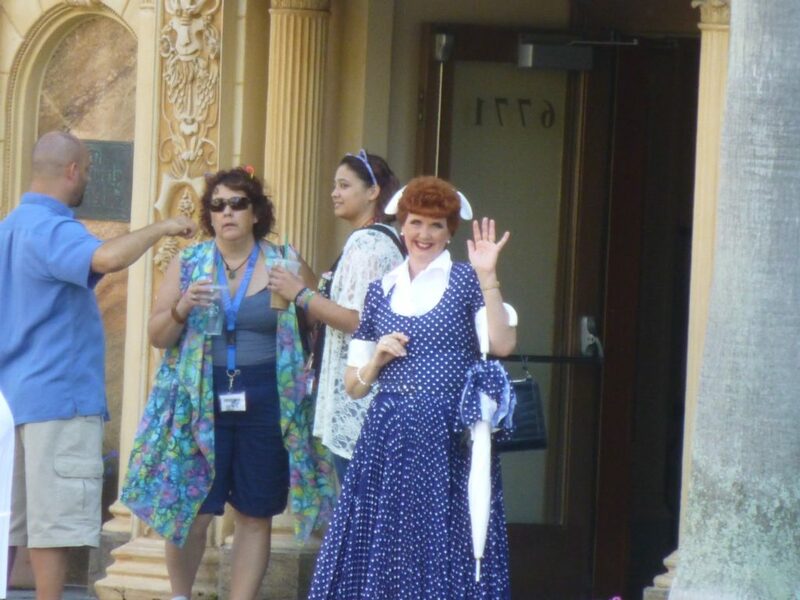 And she’s still out in the parks every day for photos and autographs! 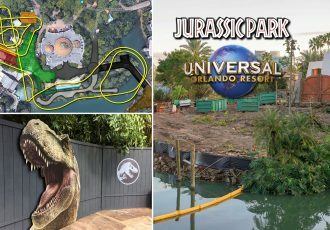 I hope you enjoyed this look back at a gone, but not forgotten, attraction from Universal Studios Florida! 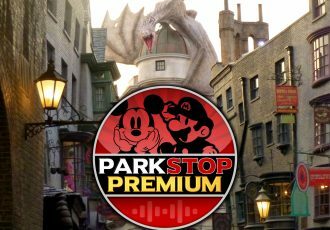 I plan on exploring more extinct theme park attractions in the future, so be sure to subscribe to the news feed or bookmark the site! 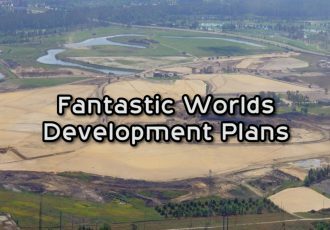 Thanks for reading and sharing! 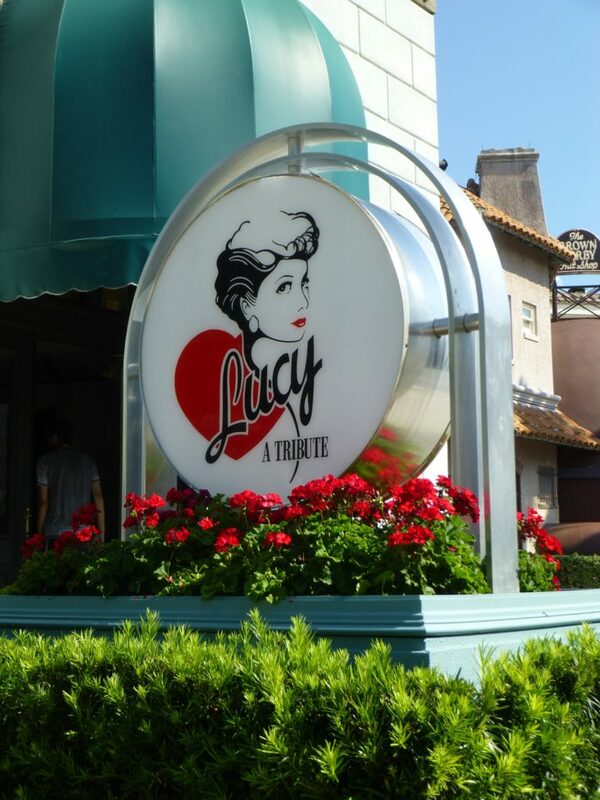 When I worked in Kissimmee, FL in Retail I visited Universal or Disney world and saw an incredible room, a kitchen I think might have been Lucy Ball’s kitchen. 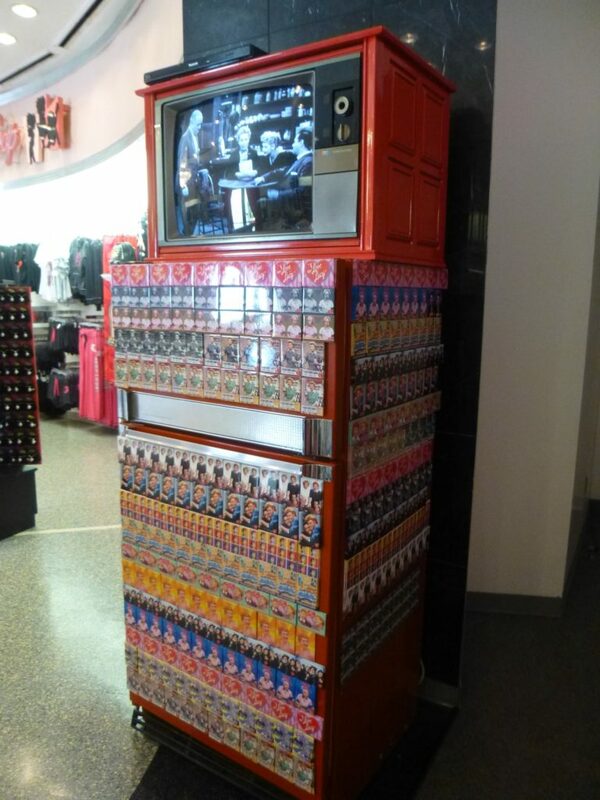 It was so retro and colorful. It would have been 1985 to 1995. It would make me so happy if I could see that room again,more than anyone could know. 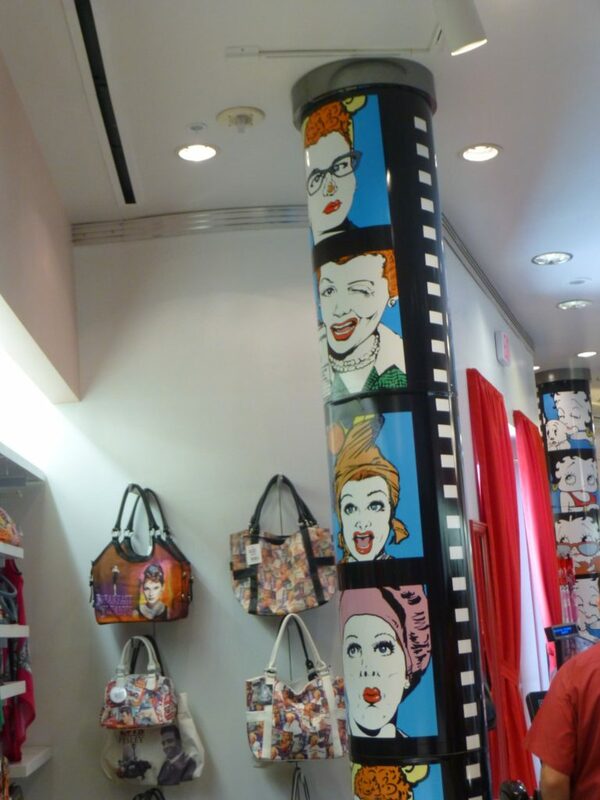 Do you think it possible you could locate a colored picture of what ever they had on that ?